Windows Episode VII, "A New Hope"
One of the big news topics last week was the release of Grand Theft Auto IV. Immediately came the condemnation of the video game industry from parent groups and others with their own conservative agenda. While games like Grand Theft Auto get all the attention you may be surprised to know there are video games designed to change the world in a positive manner. My friends at Breakaway Games know a thing or two about simulations and take the topic very serious. Best known for their battle simulations Breakaway entertains and provokes thought without gangsters and prostitutes. I’ve listed some titles you might take a look at. Playing doctor will never be the same once you have a look at “Pulse!”. Developed jointly with Texas A & M the future of medical education is featured by this virtual simulation of clinical health care training. If you’d like to see yourself as Ghandi or Martin Luther King this simulation game might be for you. Your job is to oust a repressive dictator by creating a campaign of non-violent resistance. 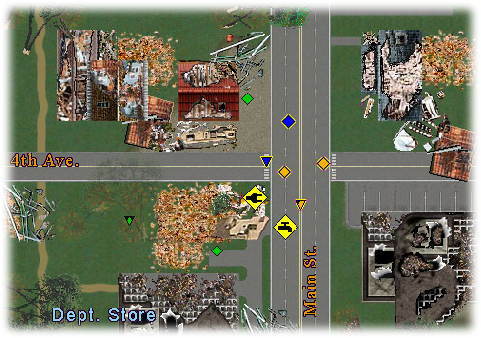 If you’d like a job with Homeland Security this simulation game is for you. You’ll face hostage situations, bomb scares, chemical spills and other potentially real life disasters. Incident Commander is distributed free to municipalities by the Dept. of Justice. If the hospital environment suites you, Code Orange Emergency Medical Management Training for Mass Catastrophe might thrill you. Can you handle mass casualties from a weapon of mass destruction as they flood your ER? Disclaimer: My friend Doug Whatley at Breakaway Games and my other real gamer friends will tell you I’m not a gamer. My attention span reaches its limit with simulations like the old Activision title “Little Computer People”. I can't play GTA because I get car sick (incredibly embarrassing to admit that) so I'm kind of excited about these. I assume one can do wonderfully perverse stuff like letting the patient die or doing surgery on him? For the record, I am a 47 year old, single woman, no kids, with no history of being institutionalized - I am, apparently, "normal". I really, really wish GTA didn't give me nasty headaches (it had been so many years since I was car sick - I think I was under 10! - that it took me a while to recognize the sensation) Conservatives can say what they like - I respect the law, prostitutes, believe in stricter gun regulation (hey, cars and guns, both potentially deadly, why should use of one be highly regulated and the other not?). I am not compelled to behave as if I was in a video game because I play video games. BUT I still have aggressions and stress that are relieved only by a combination of kitty cuddling and violent video games. If I can act out in a fictional realm, I have no need or trigger to acting out in the real world.